As you probably already know, we have been living in a post-desktop world for a while now (at least, according to Google and other sources). Although it started off slow, mobile search volume has been growing to dominant levels over the past few years. There has been some confusion amongst our B2B clients over the relevancy of mobile to them; statistically, B2B sites don’t receive as much mobile traffic as B2C. Why the spotlight on mobile then? Two words: Mobile-First (Google’s newest method of indexing sites). Don’t worry, we’ll explain all about it. We know that your site’s user experience matters to you. In B2B, every prospective client is important. Whether for desktop or mobile, our aim is simple: To help you in developing an intuition about user design best practices for your business’ website. We also want to help you to achieve this. Even if you’re unsure of the technical side of things, we’re here to help you create the confidence to ask the right questions of your agency or in-house web developer, especially around critical web performance issues known to impact conversion. It’s easy to look at your own traffic statistics and believe that mobile isn’t that important to you, but that’s no longer the case. Even if mobile visitors make up only a small fraction of your audience, an unoptimised mobile site can now severely impact your SEO on both desktop and mobile. Google had been promising to switch to a Mobile-First form of indexing in late 2016 and all the signs are that the rollout started in earnest in March of this year. The quality of your mobile site has played a role in Google organic rankings for some time. However, it is now more important than ever to optimise the mobile experience if you want to remain competitive across all platforms. Mobile users: what's the difference? Provided they have a device and an internet signal, a user can access your site no matter what they’re doing or where they are. But this also means that you don’t necessarily have a user’s undivided attention anymore. Google coined the term micro-moment to describe the way that mobile users browse the web throughout the day. In 2015, they conducted a research study to see how these micro-moments stacked up against desktop sessions. You can read the full study here. What Google found out was that mobile and desktop traffic behave in very different ways: mobile users are much more focused on immediate gratification and are less likely to waste their time with slow-loading or unintuitive sites. Mobile users want quick results but are willing to give sites less time than ever before. It is worthwhile noting that due to the fast-paced nature of our industry, these numbers may be considered stale. In the years since this study was completed, mobile has grown to dominate (moving from ⅓ to ½ of global search volume). Why should my site prioritise the mobile user experience? Even though some evidence suggests that B2B users are still strongly tied to desktop browsing, the rise of Google’s mobile-first indexing means that if your B2B site has a poor mobile UX, then your overall online visibility within Google could be affected. It isn’t enough to just focus on one or the other. Even if your analytics are telling you that you receive a comparatively low amount of mobile traffic, ignoring the mobile user experience will prevent you from getting the coveted top positions, and probably bar your site from page one for the majority of the competitive terms in your market. Do I have a mobile-optimized website? Google has a couple of its own mobile optimization tests, which you can find here and here. These will focus on how quickly your site might load over a 3G connection, and whether Google’s bots consider your site a ‘good mobile site’ (integral in a mobile-first world). These will only give you information on the technical side of your mobile site. There are other tools which will help you review your mobile UI, such as mobiletest.me. Does my website load quickly enough? 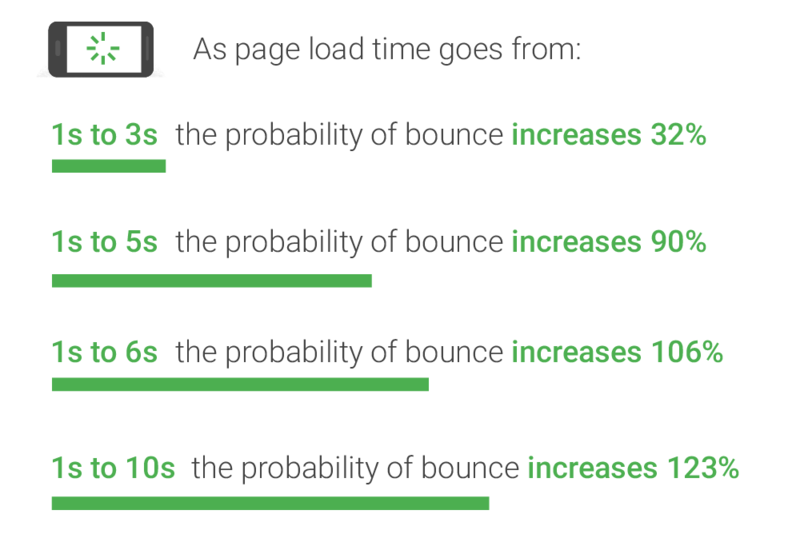 The relationship between a page’s loading speed and its mobile bounce rate is brutal. In 2016, 53% of mobile users would leave a site that takes longer than three seconds to load—well below the average load speed for mobile sites! As you know, uncompressed rich media files are generally behind most webpage bloat. Always remember to compress images appropriately and explore external hosting solutions for video. Most embedded video players, like YouTube and Wistia, have the added benefit of being able to detect a user’s connection speed and adjust accordingly. Use advanced coding techniques like lazy loading to take advantage of small mobile screens and ensure that visible content always renders first. Internet speeds are getting faster and mobile 4G is more widely available; however, be careful about using the faster internet standards as a benchmark. Try to create web pages that will work well over a variety of connection speeds. Read more about optimising your site’s technical performance here. Is my mobile UI good enough? Make use of online emulators such as mobiletest.me to make sure that the UI is consistently good no matter what device a user is browsing from. Different mobile devices can render your site in wildly different ways, so testing on various devices is key. Make sure your page element can adjust to suit the device. Keep page width consistent and don’t make users need to zoom. However, give the option to click and zoom on products pages or online image galleries. Make sure that your website supports both landscape and portrait modes. Additionally, keep content paragraphs short; a few lines on desktop will fill up the screen on mobile. As a rule, we recommend limiting paragraphs to a maximum of three lines. Short & snappy: a few lines on desktop will fill up the screen on mobile. Is it easy to navigate my site? Make it easy for users to navigate your site, getting from point A to point B with as few clicks as possible. Pay attention to what other popular sites are doing in order to get a sense of user expectations. Use your logo as a clickable link to your homepage. Keep subdomains and sister sites consistent to avoid confusion. Is it easy to search my site? An effective search bar on your site can be incredibly valuable for two reasons. Firstly, it can enable users to get where they want to go, and quickly. Secondly, you can access the data from your site search bar in order to improve your site and conversions. Internal search is not automatically suitable for all sites, and it tends to work especially well with sites whose page numbers rank in the thousands. Often visitors to your site already know exactly what they want before they arrive. Internal search enables them to find exactly whatever this is without frustration. If you choose to implement one, keep the search bar somewhere where it can be easily found. Critically, any internal search solution cannot slow down the speed of your site. It also needs to work on all devices and it should be easily integrated into your site’s design. This drop-down menu helps direct a user’s navigation by implementing categorical filters. Does my site retain visitors? Mobile visitors are typically harder to retain; keep relevant information and offers at their fingertips in order to prevent them from clicking off. Many websites benefit from including references to third party resources on their site. For example, an eco-friendly industrial engineering firm’s prospects might benefit from having direct access to government environmental data included on the engineering firm’s website. As always try to find a good balance, implementing A/B testing to find out if contextual links impact your exit rates or conversions in any way. Try to find a balance that works for you. Read more in our in-depth bounce rate guide [Here]. Are my calls to action easily seen? When a mobile user lands on your site, not only do you have a limited amount of time to capture their interest, you also have a highly limited amount of screen real estate to do so. Your primary call to action should be easily seen and typically above the fold on mobile devices. Crucially, it should not be hidden where a mobile user won’t see it. Not all sites will benefit from having a call to action so soon, but many will: each website and target audience is different. Keep your business goals in mind and pay attention to your customer flow. Stick with whatever works best for you once you have your analytics data dialled in and providing the insights you need. Are my interstitial ads creating problems? The modern mobile equivalent of pop-up ads, interstitials are rich media ads which fill the user’s screen, disrupting their browsing session until they can click out. It can be tempting to use interstitials on your mobile site, but they can be a sure fire way to increase your bounce rates if used incorrectly. Remember how we discussed that mobile users have much higher bounce rates earlier? Be aware that putting potential barriers between the user and the content that they’re looking for is not going to make them any more likely to stick around. If you absolutely must use interstitials then ‘forewarned is forearmed’: make sure that dismissing them is quick and obvious for users and be aware that Google has decided to oppose their use by penalising sites that use them. Are my forms and signups triggered at appropriate times? In order to keep mobile bounce rates low, keep pressure and urgency low. Allow your customer to make themselves familiar with your site, products and content before you ask them to commit through signing up or filling out a form. Doing so prematurely can be irritating and disrupt the customer journey. Allow users to purchase as a guest, offering to register their information afterwards. Make it easier for registered customers to check out quickly. For example, think of Amazon’s ‘one click purchase’ option. Additionally, use recognisable and intuitive platforms; at Together Digital we prioritise a clear and intuitive UI (which is why we build ours from scratch!). Are my forms mobile ready? If your site is not compatible with HTML5, then you are likely to be in need of a new site. Assuming that it is HTML5 compatible, you can designate the appropriate type of keyboard for an input box. For example, mobile devices have different keyboards available for numerical data and email addresses. Keep things simple: don’t repeat questions and use automation to auto-populate data for registered users, or to fetch potentially repetitive data (such as take shipping address from billing address). Make sure your forms do as much of the work as possible. Give real-time feedback about form errors to minimise the need for resubmits. Let a user know if they’ve made an error or missed a required entry field before they hit the submit button. When you let them know about the error, highlight the box or boxes in which the error or errors exist and be explicit about what is needed to fix the errors. Give examples for more confusing fields. Try to make proper use of user location data. Don’t request it immediately or without the context of why you need it. Make sure the user knows what benefit they get from sharing geodata with you. One of the benefits of the growth of mobile devices is that it is now possible for users to essentially call you directly from their browser. Make sure to implement interactive and simple click-to-call buttons. Make use of the growth of social media to ensure that your site is integrated. For example, many sites streamline the registration process by allowing users to log in with their social media accounts via applets.